Capricorn is the dawn of the year. For spiritual purposes, Capricorn relates to the higher heart centre, where there is the eight-petalled lotus. The heart chakra of twelve petals is ruled by Cancer and it governs the activities of respiration and circulation. The higher heart center is the seat of the Lord. The spiritual student is recommended to meditate the Lord as a beautiful form of deep electric blue color and to invoke the sound ‘Narayana’. It is not a name but a vibration that can help us reach the center of existence, where we merge with the light. For the background of the image I used the photo of a sunrise taken around winter equinox in Brazil. 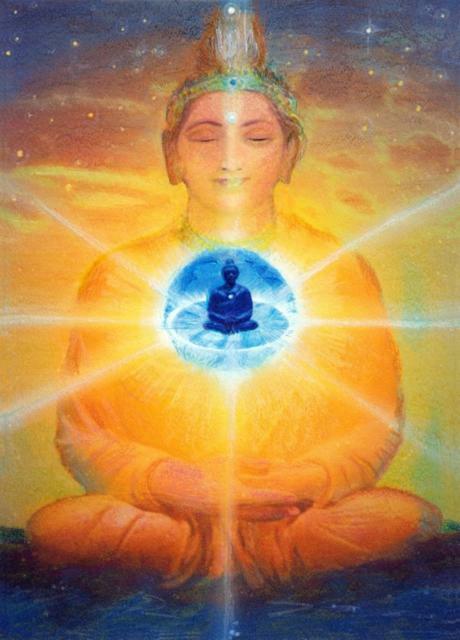 I transformed the photo of a wooden Buddha statue and integrated a picture of Ishwara, the Master principle.The light of the Sun is penetrating through the shape. The heart center was created with a picture of a blue diamond. Inside, there is the deep blue form of the Lord as the inner essence of the outer meditator. White rays radiate into the surrounding space. The different zodiacal signs are clustered in groups – you can see here all my Capricorns paintings.